Prof. Dr. Mathias Fuchs studied Computer Science in Erlangen and Vienna (Vienna University of Technology), and Composition in Vienna (Universität für Musik und darstellende Kunst Wien) and in Stockholm (EMS, Fylkingen). 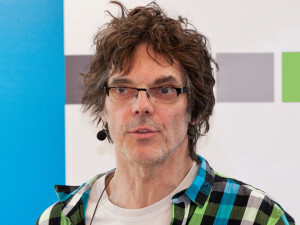 In 2010 Mathias Fuchs received his Doctor title by Humboldt University of Berlin for a PhD thesis on the meaning of sounds (“Sinn und Sound”). He has pioneered in the field of artistic use of games and is a leading theoretician on game art and games studies. He is an artist, musician, media critic, and Professor at the Centre for Digital Cultures at Leuphana University Lüneburg, Germany. He is also Director of the Leuphana Gamification Lab.